The previous two chapters discussed ULD storage and movement, two subjects that can be considered a foundation for this chapter, which focuses on continuing airworthiness. Only with correct and effective storage and movement do ULD stand a chance of remaining in an airworthy condition for a reasonable period of time. 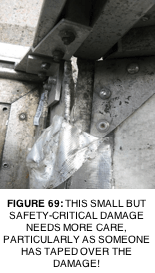 However, the function of inspecting a ULD and determining whether it is in an airworthy condition before it is loaded with cargo is just as important as preventing damage in the first place. 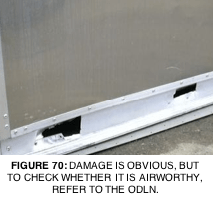 The ultimate responsibility for only loading airworthy ULD into aircraft lies with the airline, and they can certainly monitor the condition of all ULD at aircraft cargo doors. However, this process is not as easy as it sounds, as the loading of high-capacity wide-bodied aircraft is a high-pressure and time-sensitive activity. It would place an immense burden on the limited staff that perform this function if they were required to also assess airworthiness and deal with rejected ULD at this point. Instead, it is far more efficient for upstream operators to carry out the necessary inspections before the ULD reaches the aircraft. Inspections should occur before build-up commences, preferably at the time when removing the ULD from storage, or even before the ULD is placed in storage after the previous breakdown. Today, most cargo and ramp operations are outsourced to third-party service providers, which can range from extremely large global organisations to single airport operators. 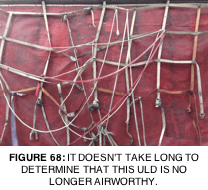 However, there is a common theme: unless these service providers carry out adequate checks on the condition of the ULD that they are building up, storing, or moving around, then there is a high chance that non-airworthy ULD will end up at the aircraft door. 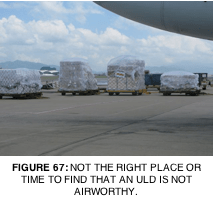 A common misconception in the air cargo industry is that operators do not have the time to inspect each ULD before putting it into use, and that it takes too long to read up on damage limits before inspecting a ULD. 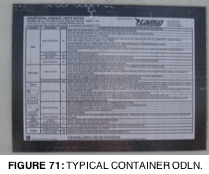 In actual fact, inspecting a typical container or pallet for damage takes very little time, as all that is required is a visual check that can be performed in mere seconds. Indeed, it is only when some amount of damage is found that it becomes necessary to check whether the damage falls inside or outside the permitted limits. Obviously, no one would wish to drive a car on a freeway with under-inflated tyres, or to set off on a long journey with insufficient fuel. To do so would be irresponsible, and most people will instinctively check the condition of their vehicle before setting off. The same can be said for a ULD. It is simply a matter of getting into a habit of performing a quick but thorough inspection before each operation. We briefly touched on continuing airworthiness in Chapter 1, in terms of the responsibility of ULD designers to identify limitations for a ULD as part of the certification process. In this chapter, we will instead consider the subject from the point of view of an operator, and establish that the requirement for continuing airworthiness must be a top priority of every person who works in the ULD operations chain. For such a critical matter, a weak link cannot be permitted. As discussed in Chapter 1, the allowable damage limits for any ULD will be contained in its CMM. The question is, how does this information make itself available to a person working with a ULD in a warehouse? Until a few years ago, the answer to this question was, “not very well”. 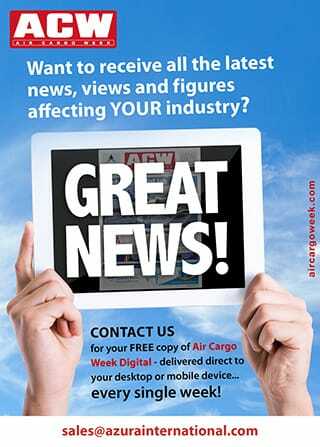 Information and policies about continuing airworthiness were typically written up in airline cargo loading or operating manuals, which are often located in an office removed from the actual ULD operations area. Further, these manuals are often not updated when new ULD are introduced into any particular airline’s fleet, thus leading to discrepancies in information. The situation was further complicated by the growth of multi-user air cargo terminals, where ULD from multiple airlines would be stored together under a single roof. How could an organisation be expected to effectively inform and train their staff to determine the continuing airworthiness of so many different varieties of ULD? The answer is with great difficulty, and as such, the determination of whether a particular ULD was safe to load often became a matter of chance, rather than an assessment of accuracy and dependability. 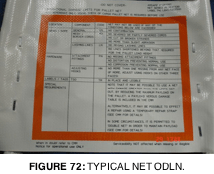 To rectify this, IATA launched an initiative whereby all ULD, containers, pallets, nets and, more recently, straps, built from 2011 onwards are required to be delivered with an Operational Damage Limits Notice (ODLN) clearly displayed as a decal or tag. While no two brands of ULD will necessarily have the same damage limits, the ODLN acts as an industry standard ‘placeholder’, into which each original equipment manufacturer (OEM) can insert specific limits for that design. As this initiative has been in force for a few years now, many ULD are fitted with an ODLN. These added features create a quick and convenient reference point for any person wishing to check whether the damage found on a ULD exceeds allowable limits.